Similar to a Chute Conveyor, Wheel Conveyor, Roller Conveyor, and Chain Conveyor, a Slat Conveyor is another transport equipment designed to move material efficiently from one location to another. The big difference is that a Chain Conveyor is not based on gravity, but on mechanics and electricity and it’s application is a bit more specific to the type of operation. Slat conveyors can be used for transportation, accumulation, assembly, side loading and unloading and frequent stop/start applications. We are required bucket type conveyor for pharma packaging industry, we want only single bucket type conveyor, to convey material from raw material to mill unit , both end are at different height , and at one end we want to tilt the bucket and put material in mill. 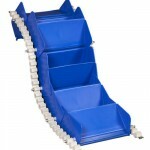 if you have support us about this type of conveyor so pls contact .